This post has nothing to do with bikes. It does, however, have something to do with carfree days which was the original purpose of this blog. When a preschooler isn’t in school, you have to find something to do to avoid hearing “I’m bored” all day long. This isn’t hard – we have a lot of fun stuff to do in our neighborhood. Neither Tim nor I are big fans of playgrounds (shhh – don’t tell our children) So, we try to find other, non-playgroundish things to do. Looking for insects, digging in the dirt, playing in the creek near our house, picking up leaves – all highly entertaining. And when you have a four year old boy, seeking out big construction equipment is a must. 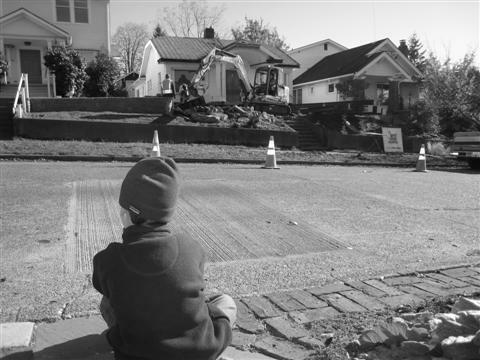 My son and I enjoyed a carfree day watching a crew prepare to lift a house in our neighborhood. It was a beautiful day so I enjoyed it as well! We have to return to the site today to watch the actual lifting….ah the things we do for our children. This entry was posted in extravehicular activities, kids, neighborhoods, seattle and tagged activities, construction, kids. Bookmark the permalink.